Dwellers Without Decorators: The perfect dinner party gift. When I am invited to someones home I usually bring a gift, - a scented candle or a bottle of wine - BORING! 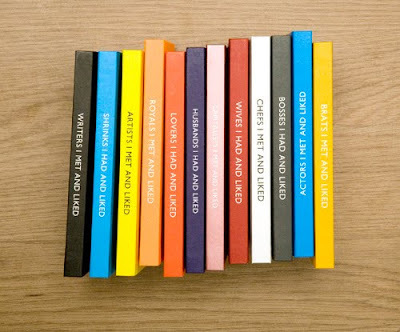 Flipping through House Beautiful I found my next go to gift- Archie Grand Notebooks They are so fabulouse when stacked. Love these! I love all the titles - anyone who sees this post should click the link and view the books there - the bright colors are great and the titles are hilarious. I too usually default to wine or something edible so it's nice to have another idea on the list. Thanks Suze!